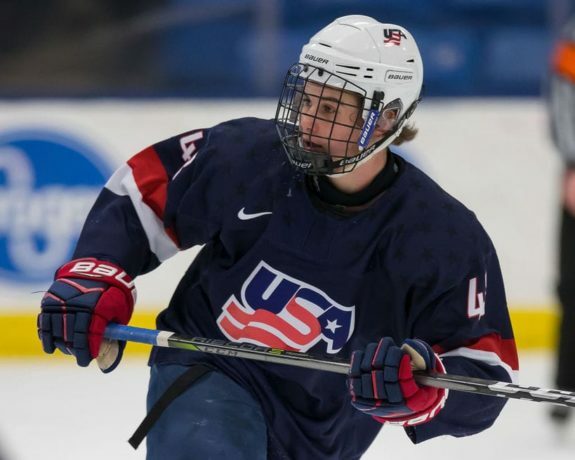 VANCOUVER — Jack Hughes did his best to downplay the marquee matchup that has scouts salivating over Saturday’s gold-medal game at the 2019 IIHF World Junior Championship. In a near-perfect script — perfect still would have saw Canada defend gold on home ice — Hughes, of the United States, and Kaapo Kakko, of Finland, will clash in a battle between the top two prospects for the 2019 NHL draft. That showdown was supposed to take place on New Year’s Eve in Victoria, but Hughes was sidelined by a minor injury that kept him out of three round-robin games. The projected first overall pick returned for the Americans’ quarterfinal against the Czech Republic on Wednesday, recording a sweet assist in that 3-1 victory, before also setting up the goal that stood up as their semifinal winner in a 2-1 triumph over Russia on Friday. “It’ll be fun, I mean he’s a good player, but they have two NHL players on their team too in (Eeli) Tolvanen and (Henri) Jokiharju,” Hughes said when asked about the possibility of facing Kakko in the final. “They have a really good team over there, with a lot of good players. But I’m just worrying about myself and I feel really good where I’m at. Jack Hughes was all smiles after beating Russia in the semifinals, but he wasn’t about to hype up his matchup with Finland’s Kaapo Kakko in the gold-medal game of the 2019 IIHF World Junior Championship. Hughes didn’t want to take the attention off his team’s accomplishment or put the spotlight on himself, so he dodged most the draft-related questions to some degree. But Russia’s lineup also featured a potential top-five pick for 2019 in forward Vasili Podkolzin, someone Hughes was more willing to discuss following their encounter. “I really like watching him play. He’s a player I really respect, and I think he’s going to be a really good player. I’m kind of high on him,” Hughes said in heaping praise on Podkolzin, who was one of Russia’s better and more dangerous players throughout the third period of that semifinal. Now it’s all about Hughes and Kakko for gold, and the Americans are certainly happy to have Hughes back in the fold for the championship game. “He’s a huge threat every time he’s on the ice, so when you get someone like that back, with that talent and calibre of play, it’s definitely something you can use to your advantage,” said Team USA goaltender Cayden Primeau, who stood tall in stopping 34 shots, including all 15 he faced in the final frame. Hughes is a difference-maker, even if he’s still not at 100 per cent health here. He’s commonly compared to Patrick Kane and some also see shades of Connor McDavid in his game-breaking ability. Kakko is there too, having produced a highlight-reel assist of his own in Finland’s semifinal routing of Switzerland. Kakko, who most scouts have ranked second for 2019, had the poise to slide a backhand pass through the crease to Rasmus Kupari at the far post for a tap-in that rounded out the scoring on a second-period power play. “He seems a little bit like Auston Matthews, with the short stick and quick hands and he’s a good skater. He can make some good plays in tight areas. That’s the biggest one and we saw it today, that back-door pass, it’s pretty impressive,” Finland defenceman Henri Jokiharju said of Kakko. 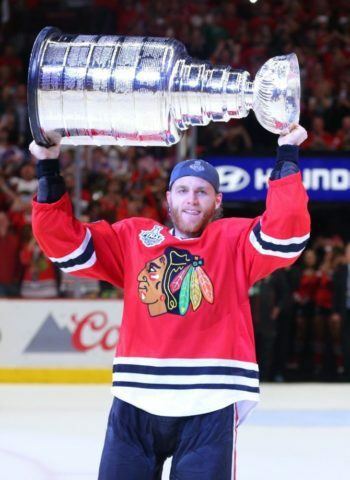 Patrick Kane, the first overall pick from the 2007 NHL draft, has won three Stanley Cups with the Chicago Blackhawks in 2010, 2013 and 2015. He also won the Hart Trophy as the league’s most valuable player in 2016 when Kane led the NHL in scoring. He also weighed in on the Hughes’ comparison to Kane — an NHL superstar that Jokiharju has been playing with and practising against as a rookie for the Chicago Blackhawks this season on loan to Finland for this under-20 tournament. Some believe Kakko will wind up challenging Hughes for first overall in June, similar to how fellow Finnish forward Patrik Laine gained ground on Matthews in 2016. “There’s lot of talk, but time will show who will be the No. 1 (pick),” Kakko said through Jokiharju as his translator. The gold-medal game between the United States and Finland is slated for 5 p.m. PT, following the bronze-medal game between Russia and Switzerland at 1 p.m. PT, both at Rogers Arena. In their round-robin contests, the United States defeated Finland 4-1 without Hughes, while Russia downed Switzerland 7-4. “The goal is gold, so we’re not quite finished yet,” said Primeau. “The battle is still there. We have a chance to represent our country for gold, so it’s going to be a huge honour and something special. “We still haven’t played our best game yet. There’s more to come from this team,” added Primeau. The Finns are excited to have the opportunity to avenge that round-robin loss. “It was a tough game for us, we didn’t score that much, but we’re going to be good tomorrow and put those pucks in the net,” said Kakko. Meanwhile, in the relegation round, Kazakhstan advanced to the 2020 World Juniors in the Czech Republic by defeating Denmark in two straight games, 4-3 on Wednesday and 4-0 on Friday morning. As a result, Denmark will be replaced by Germany next year, with the Germans qualifying by winning the Division 1 tournament in mid-December. With Donald Trump and Vladimir Putin looking on — in the form of several fans wearing masks of their likeness — the United States and Russia played a feisty, fast-paced first period. After Russia had a goal disallowed at 7:47 — when Nikita Shashkov redirected Dmitri Samorukov’s back-door pass into the net with his skate — the Americans opened the scoring on an Oliver Wahlstrom one-timer of Logan Cockerill’s perfect feed off the rush at 14:29. As nice as that goal was — and the non-goal was, too — it was overshadowed by the physicality between two powerhouse nations with no love lost. Russian forward Vitali Kravtsov, a top-10 pick for the New York Rangers, had an especially rough first period. He tried a fancy dangle through his own legs in the early stages, only to be flattened by American captain Mikey Anderson. And at the first-period buzzer, when Kravtsov let go a late shot, he got absolutely buried by Dylan Samberg, setting off a lengthy scrum that sent a couple more bodies to the ice. And the Russians pushed back too — somebody plowed over Samberg in that sequence, and Artyom Galimov wiped out Jack Hughes earlier in the opening frame. Undeterred, Hughes set up Alexander Chmelevski for a power-play goal to make it 2-0 at 4:20 of the second period — a tap-in from the top of the crease, with Kravtsov in the penalty box for tripping. But the Russians rallied in the second half of the middle stanza, getting all kinds of momentum from their top line — a trio of NHL first-rounders in Kravtsov, Grigori Denisenko and captain Klim Kostin. Denisenko cut the deficit to 2-1 by driving wide on Samberg and sniping a shot from a bad angle on Primeau at 13:36. That got the Russians going and they came close to getting the equalizer on a couple occasions towards the end of the second period. Kostin sent a cross-ice pass to Kravtsov on the rush but the puck skipped over his stick on what looked to be a sure goal had they connected, then Denisenko dropped a pass to Kravtsov in the slot with Primeau out of position but that shot deflected out of play off an American defender in the crease. 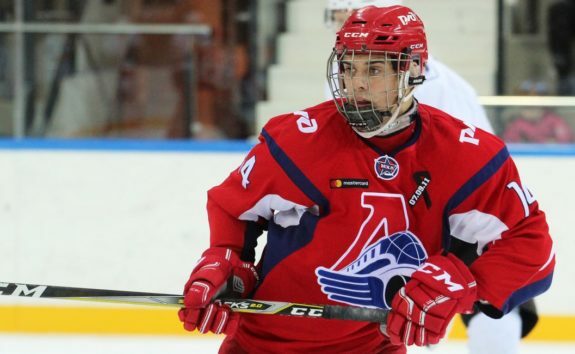 Grigori Denisenko has a ton of upside and he’s now scored in four straight games for Russia at the World Juniors — showing why the Florida Panthers selected him 15th overall in the 2018 NHL draft. The Russians carried over a nearly full power play to the third period and almost tied the game a few more times on that advantage. Primeau twice denied Kravtsov one-timers without giving rebounds — the first teed up by Samorukov and the second a cross-ice feed from Denisenko — while American defenceman Phil Kemp swept another puck off the goal-line after a shot from Kostin squeaked through Primeau. “It was crazy, to be honest I wasn’t really thinking about it, I was just trying to dig it out,” Kemp said of his game-saver. “I almost hit the post, it was 50-50, so I was thankful. Russia continued to pour it on, with Podkolzin coming on strong down the stretch, but they couldn’t get another puck past Primeau as the United States held on despite getting outshot 15-7 in the third period and 35-27 overall. Vitali Kravtsov was a big-time riser in the 2018 NHL draft, going ninth overall to the New York Rangers after dominating the KHL playoffs. He’s been a force here at the World Juniors too, but he couldn’t beat Cayden Primeau for the tying goal in Russia’s semifinal against the United States. Podkolzin had Russia’s best chance in the final minute. Sent out by Valeri Bragin as their extra attacker, Podkolzin carried the puck on the zone entry and cut hard to the crease, producing a rebound but his teammates couldn’t pounce and the Americans cleared that opportunity as the pro-USA crowd of 14,355 cheered the final few seconds once the threat of overtime was alleviated. That was the Americans first game in Vancouver and it appeared thousands of fans made the trip up from Seattle and throughout the Pacific Northwest. Asked who he expected to play — or if there was a preferred opponent for the final — Hughes wisely took the high road with a little humour. Finland blitzed Switzerland from the opening puck-drop, scoring four times on eight shots in the first seven minutes 43 seconds to chase starting goaltender Luca Hollenstein — the hero from Switzerland’s 2-0 quarterfinal win over Sweden with a 41-save shutout. This wasn’t Hollenstein’s night in the semifinal, but Switzerland didn’t stand much chance against Finland’s early barrage. Jesse Ylonen opened the scoring in the first minute — just 40 seconds in — when his quick shot from the slot on a set-up from Santeri Virtanen eluded Hollenstein, then captain Aarne Talvitie netted the 2-0 and 3-0 goals before Jokiharju’s power-play marker summoned backup Akira Schmid from the Swiss bench. Talvitie took a drop pass from Rasmus Kupari and fired high blocker on Hollenstein for his first at 2:55 before following up on Kupari’s opportunity off the rush to roof a rebound at 5:56 for his second. Then, on the game’s first man advantage, Jokiharju’s point shot through a screen sailed past Hollenstein to end his brief outing. Hollenstein didn’t have a whole lot of help, though, and the Finns kept attacking in waves against Schmid — outshooting Switzerland 14-1 through 14 minutes. Switzerland did manage to capitalize on their first power play, cutting the deficit to 4-1 at 16:40 when Philipp Kurashev found a loose puck in front of the net and beat Ukko-Pekka Luukkonen for his sixth goal of the tournament and fourth of the power-play variety. Switzerland enjoyed another little push to start the second period, led again by Kurashev, but Finland made it 5-1 and snuffed out any hope of a comeback at 7:56 of the middle frame, when Aleksi Heponiemi put away the rebound of Tolvanen’s chance from another rush where the Finns proved too fast. And also too skilled as evidenced by Kakko’s slick feed to Kupari for a wide-open net at 14:57, another man-advantage goal that Schmid didn’t have a hope of stopping in a Globetrotting display by Finland to extend their lead to 6-1 through two periods with a 29-12 gap in shots. “He doesn’t care that much about his own plays, he just wants to help the team as best as possible,” Jokiharju said while translating for Kakko. The third period played out without much suspense, as to be expected with the lopsided score and both teams having to regroup for medal games on Saturday. Still, the Finns put on a good show from start to finish for the 14,014 fans in attendance — many of whom made an early exit once the outcome was obvious.